Part of the benefit of playing as a true freshman is the experience a player gets early in his college career. Such is the case with Justin Hollins, an outside linebacker who will see an increased role after limited action last season. You may not be familiar with the name, but get used to hearing it in 2015 and beyond. Hollins takes town Washinton’s John Ross III. Hollins was a bit of a surprise recruit for Ducks in 2014. Oregon went deep into Big-12 territory to court Hollins from his hometown of Arlington, Texas. After spending three years at a private school, the 6’6″ 220 pound athlete dominated Texas’ 5A division during his senior prep season. A 3-star recruit, Hollins impressed scouts with his explosive speed, which led to 59 tackles during his lone season at Martin High School. Perhaps it was bad luck that Hollins didn’t receive the attention he could have received in high school. After all, his teammate was 5-star recruit Myles Garrett, a defensive end who committed to Texas A&M and took the SEC by storm last fall. But fate is a funny thing. Garrett’s commitment may have allowed Oregon to swoop in and acquire Hollins, forming an unlikely couple with serious potential. 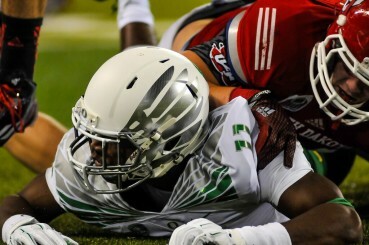 Hollins’ impression on Oregon’s coaches continued after his enrollment in Eugene. He earned a spot on the 70-man travel roster and earned playing time as a true freshman. Despite a limited role, Hollins managed to see action in 14 of 15 games last season. Hollins saw valuable playing time as a freshman last season. During his brief stints on the field, Hollins spent most of his time on special teams, with very limited appearances defensively. He racked up 10 tackles in 14 games, including one tackle for a loss. While these stats are admittedly unflattering, game experience is vital for a young defender and will prove crucial as Hollins grows into a larger role over the next three seasons. As the National Championship Game neared, Ryan Osborne of the Star-Telegram asked Hollins what the transition from high school to college had been like. Fast forward a few months, and 2014 is in the rear view mirror. With the departure of Tony Washington and Derrick Malone, the door is open for Hollins to crack the rotation and be an impact defender for the Ducks. Hollins’ long frame gives him great tackling range and allows him to wrap up smaller players with ease, an ability that will be valued by Oregon’s defensive coaches looking to spice up the defense with fresh, athletic faces. 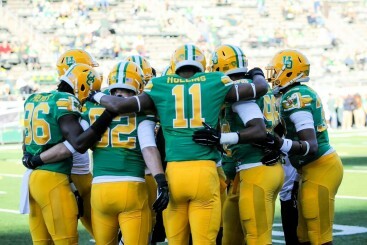 Hollins huddles with his fellow defenders. 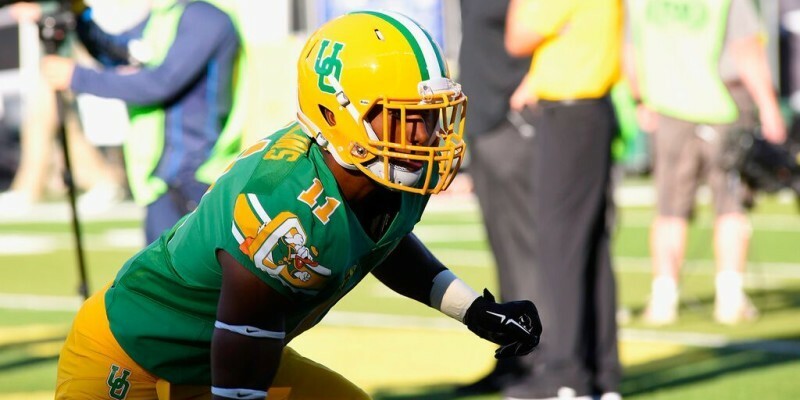 As FishDuck.com writer Nik Brownlee noted in his spring football report, Hollins could be a force to be reckoned with on the edge. 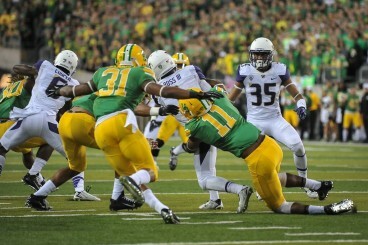 Whether or not he starts, the Ducks liberal front seven rotations will provide Hollins plenty of playing time. While the Spring Game was an impressive showing for the Oregon offense, the defense had its share of big moments as well. Unfortunately for Hollins, he remained on the sidelines for those moments, sporting a cast on his ankle. Fellow true sophomore linebacker Jimmie Swain stole the spotlight, recording seven tackles to close out a strong spring of his own. The injury is obviously a concern for Hollins’ immediate future, but there is still plenty of time before fall camp starts. He should be ready to go come August, and will continue to earn the trust of defensive coordinator Don Pellum. If his previous displays of speed and explosiveness are any indication, Justin Hollins has a bright future as an Oregon Duck.